Call or Text now to arrange your summer vacation to Lake Michigan! 616-970-4552 or make your secure online reservation by clicking "Availability". LESS THAN A WEEK STAY MAY BE OK WITH A MINIMUM 2 night stay, for all months except June, July and August. For these 3 months, they are weekly rentals; 5, 6 or 7 nights stay. You will be pleased with the charming 1940’s cottages from the moment you arrive. Nestled into a residential part of town with neatly manicured homes, you will be welcomed by the old fashion sign of Lakeview Cottages and the Main House and five little cottages lined up in a row! Each cottage is uniquely decorated and furnished to include brand new luxury beds made right here in Michigan! Each kitchen is fully stocked with everything that you may need (pots, pans, dishes, etc), including a microwave, coffee pot/ filters provided, stove and fridge. Enjoy the outdoor commons area complete with gas grills, a basketball court, laundry facilities and a fire pit. This is the little cottage resort that you have been searching for! The place that you look forward to visiting each year for your family summer vacation. Our repeat guests LOVE the location! You can expect to walk into a neat and tidy cottage that is clean and ready for your vacation to begin. After you settle in, you can open up your lap top and enjoy the Wi-Fi, sit outdoors and relax with a book or throw your suits on and run down to Lake Michigan! Whatever you want to do when you arrive is just fine with us! Not only is our cottage resort well equipped for your vacation, you will love being just 2 short blocks to the shores of Lake Michigan! 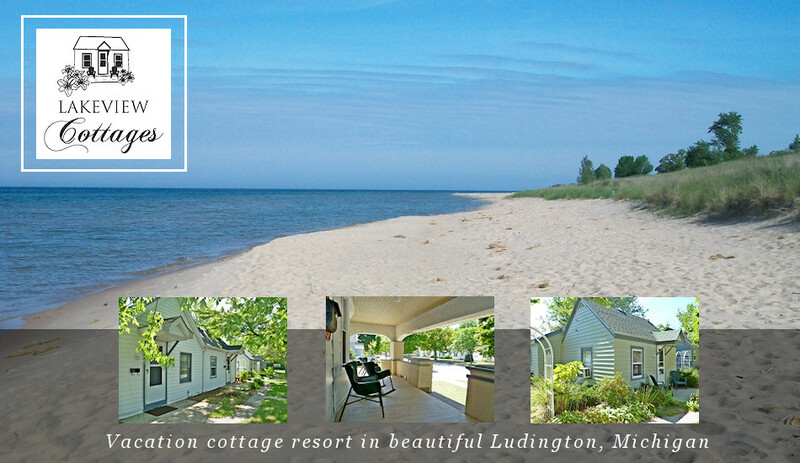 The cottages are a perfect walking distance to all Ludington has to offer. Walk to the beach, the downtown shops, recreational parks, the skate park, etc. If you like tennis, bring along your rackets and enjoy the courts just one block from us! Our guests also recommend bringing along bikes. You can forget about your car for the entire vacation and enjoy the benefits of being close to everything. As the owner, we fell in love with the property at first glance, and we are sure that you will fall in love with it too!